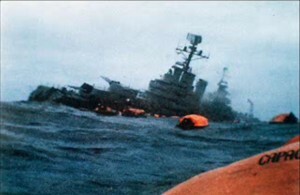 Analysis: Interception of Orders from Argentina, + Who was responsible for sinking the Belgrano? Where reasonable people cannot differ is that when Mrs Thatcher says that no news of the Peruvian proposals reached London until three hours after the Belgrano was sunk, or more precisely, in answer to the Shadow Cabinet, written on behalf of the Shadow Cabinet by Denzil Davis, the spokesman, she said that the first indications of the Peruvian Proposals reached London at 11.15 pm Sunday 2nd of May. That is not true. Michael Harbottle used the word “Sabotage.” I haven’t used that particular word before but I think it is a very apt description of the situation. Now you asked me some precise questions, first of all, about the Belgrano itself. Though, from the 2nd of April I had opposed the sending of the Task Force, as you said in your introduction, on the 3rd of April I had pleaded to speak, to put a consensus point of view; but Mr Speaker George Thomas, to his eternal discredit, would have none of it: not because he didn’t call Tam Dalyell, but because he didn’t call any of the more vociferous dissenters. And we now know from his memoirs why: because he took a view of the National Interest, that the Prime Minister had to be supported. The memoirs of George Thomas really are very revealing. On the 4th of April I made a statement, fully carried in the heavy newspapers: that the sending of the Task Force was the most ill-conceived expedition to leave these shores since the Duke of Buckingham went to La Rochelle in 1627. I opposed the sending of the task force.